As Dr. Brach says, the most difficult and pervasive challenge to Westerners today is the suffering caused by our feelings of unworthiness and self-aversion. Radical Self-Acceptance offers a way to break out of this emotional prison, so you can discover the freedom that comes with kindness and true appreciation of yourself and others. 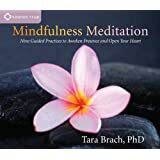 Tara Brach has been practicing and teaching meditation since 1975, as well as leading Buddhist meditation retreats at centers throughout North America. She is a clinical psychologist, the founder of the Insight Meditation Community of Washington (IMCW), and the author of Radical Acceptance (2003) and True Refuge (2013). 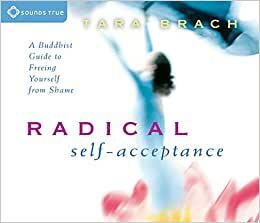 Visit Tara Brach's website. All I can say is that this book has been a life life-changing journey for me. By far my favorite self-help book (many of which I find banal), if one could call it that. It includes some profound insights/quotes and stories, along with a comprehensible explanation of some fairly esoteric Buddhist principles. 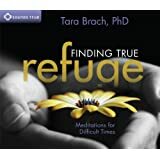 Often Tara uses the stories and experiences of the people she has met and helped along her path to aid or illustrate a point, which makes it more enjoyable to read than a book in which the author is always speaking to the reader in the abstract. It really helps to humanize her ideas and bring them home. The narrative is very well done. The book begins by characterizing the commonplace anxieties of modern life, including insecurities around being good enough and the search for satisfaction and purpose. She invites the reader to share her own journey and relate to her experiences. 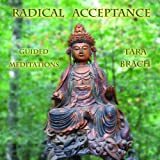 She gives an explanation of what 'Radical Acceptance' is and goes on in the subsequent chapter to share the stories of her friends & clients, using them to illustrate how her teachings have helped liberate them from their experiences. One of the things Tara does remarkably well is incorporate wisdom, poetry, and stories from various spiritual sources, in a way that really melds into what she is trying to teach. It's clear that she has much more to offer than her personal wisdom, but also the wisdom of teachers past. My favorite quote from the book (regrettably I do not have the source's name) is from a Zen philosopher: "true happiness is learning to live with imperfection". This comes to mind regularly when I am worried about myself or upset that something isn't as I want it to be. What I like the most about this book is that it really stands apart to me as a Buddhist teaching text. I've embarked on Zen reading before, but this is the first one to actually inspire me to begin my own meditation practice. In fact, I've begun watching her YouTube videos also, and really feel that she is an adept spiritual teacher. That said, I don't think one has to adopt the Buddhist philosophy to get something out of this book, but I guarantee that a read through it will impress upon the reader some of the wisest lessons it has to offer, which I find are much more humanistic than typical religious dogma, and can fit into any belief system. This book was everything I’ve needed my entire life. My therapist recommended this book when I hit a low point— I was struggling to find a job and had gained significant weight due to a long history of stress-induced compulsive eating. I had hit rock bottom in terms of self worth. While I had practiced vipassana/insight meditation for years, this book revolutionized how I practice. It taught me to how to welcome my difficult thoughts and feelings into my practice and gain wisdom from them. I’ve been a very emotional person ever since I was a child. I easily got upset and was constantly sent messages like “Don’t take things so personally” and “Get over it.” Over the years, I learned to suppress my emotions and deny them. I learned maladaptive behaviors like the compulsive eating or lashing out at people after pent up feelings. This book taught me a totally new way to relate to my emotions. I’ve learned to feel them in my body, explore the messages they hold, offer them kindness, and ultimately move past them. Ironically, I never really knew how to “not take things personally” until I read this book. Unlike anything else I have ever encountered, this book gave me the tools I needed to get through life’s hardships and my emotional turbulence. The writing is also beautiful. 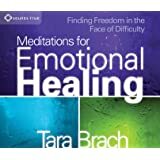 Tara Brach artfully shifts between stories about herself and her patients, Buddhist wisdom, excerpts from poems/fables, and advice for her readers. Since I had already been practicing Buddhist meditation for a while, I was already sold on all the Buddhist teachings in the book. I could imagine that a person new to Buddhism might relate to the book differently. In summary, this book was everything I needed and changed my life. I highly recommend it. I know I will turn back to it for years to come. Thank you Tara for your wisdom. 5.0 out of 5 starsOne of the best books I've ever read. I liked it so much, I purchased five more to give away. I don't think everyone needs this book. Although I am sure it would benefit everyone. But, for those of you who are like me, this book can be described as being 'needed'! I am a perfectionist, always striving, never accepting myself the way I am, always harsh with myself, etc. etc. I think I will read this book at least once a year for the rest of my life. I wasn't raised Buddhist and would not describe myself as Buddhist now, but that did not detract in any way from my ability to absorb the truths in this book. This is a practical, well-written, generous-hearted, hopeful book. I strongly recommend the book and most of the practices to any reader. However, if you have suffered significant abuse or trauma, you should not attempt the visualisations and meditation in Chapter 9, tonglen, regarding those issues. This book is most helpful for those who are managing more typical sufferings; stress; being self-critical or judgmental of others; experiencing general anxiety; struggling with self-image or forgiveness of others, etc. You will find peace, hope, and happiness through the practices artfully conveyed in this book. Thank you, Tara.